Throughout the book the author describes in great detail the atrocities these people endured, including some of his own family members. Written through the eyes of a Russian Jewish family man, the author provides great historical facts, as well as documents and pictures to support his memoir. Readers will find that even though individuals endured the worst of conditions, they still retained their optimism and hope. This is not a book one can just breeze through. Filled with numerous historical facts and detailed descriptions of several family members, it is a slow book to read. Individuals who love to read historical information and facts will love it. The book starts with the arrest of the author’s grandfather on his mother’s side, and moves through WWII from 1941-1945, to the time that his mother and other family members began their journey of emigration. Dunaevsky and his wife came to the United States in 1979, and his mother arrived in 1982 at the age of 62. Interestingly enough, even though his mother was excited about coming to the United States, she was still hesitant. Leaving her homeland meant leaving friends, family, and the “comfort zone” of knowing what to expect, regardless of the hardships she endured. Initially as with many immigrants, adjustments take time, however with English language classes, and slow methodical steps, she was able to adjust extremely well, and became a valuable asset to new immigrants. 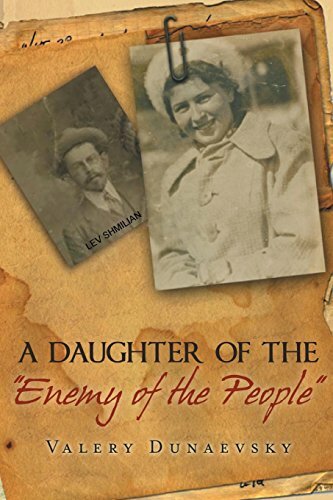 Overall “A Daughter of the Enemy of the People” by Valery Dunaevsky is a good read and certainly gives an abundant picture of life during the Stalin years. It is written well and full of detailed facts and documentation.